AHA! New film for JI? "Green Zone"
Also they say there'll be some shooting in London so he'll be close to home and family. Which I'm sure he likes. an interview, from CBS news, posted over on the IMDB thread.. Thanks for that, Kim. This movie sounds like it's going to be very thoughtful and interesting, and I'm glad to hear it has the support of the troops who are participating. I was a little startled to see that the HMMWVs being used with their doors off. That would seem to sort of negate the whole point of a HMMWV! Thanks, Kim! This film should provide an interesting insight, especially for people like me who'd never heard of the Green Zone. After March 25 th, several locations in London..crowd scenes..
How interesting--I wonder why they need to be "North American". The stereotypical "American" look is . . . I also read that they had filmed stuff in Spain, using Norwegian students and tourists to achieve the effect! What portion of the story features Americans in uniform in London?? I'm not following along very well tonight . . .
Thanx for posting this bit of news Char! I don't like Matt Damon either, HAHAHAHAHA! 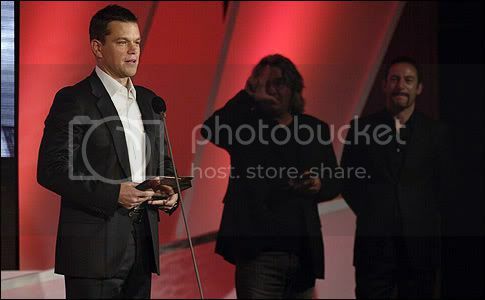 I of course assumed that Matt Damon wanted to lick Jason Isaacs' face. Might be a bit awkward to work together after that, I can't help but think . . .